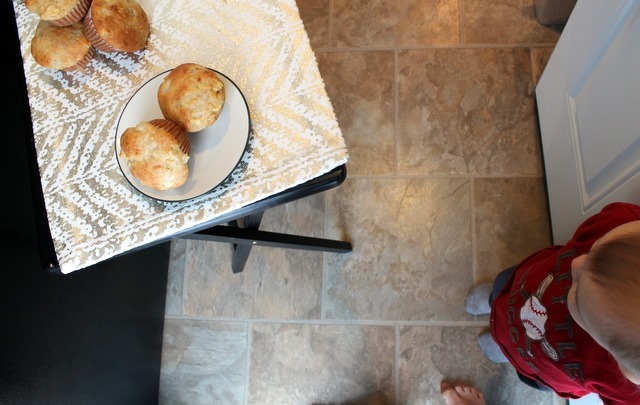 Who doesn’t love a good muffin recipe, right? 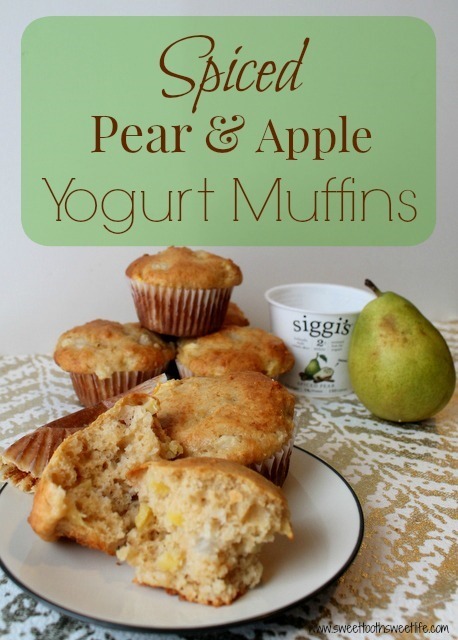 Especially when they’re packed with ripe, juicy pears, sweet and crisp apples, and flavored with some of the best tasting yogurt I’ve ever had. Not kidding. Since Lucas was still sporting a fever Sunday night in to yesterday, I took a sick day from work to stay home with him. Thankfully, when my child is sick, he likes to sleep. A lot. Just like his mama. So with some of my free time (whaaaat?!) I decided to do a little baking. I can’t tell you the last time I made muffins. It’s been ages (since most of my baking lately has been devoted to cookies), but the result turned out incredible and these guys turned out to be a hit with the whole family. 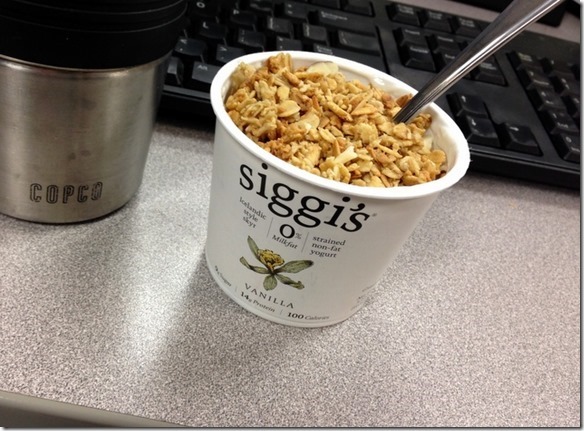 I already told you guys before that I seriously love siggi’s yogurt. Siggi’s is an Icelandic style skyr, which is a thick, creamy, absolutely delicious, high-protein yogurt. 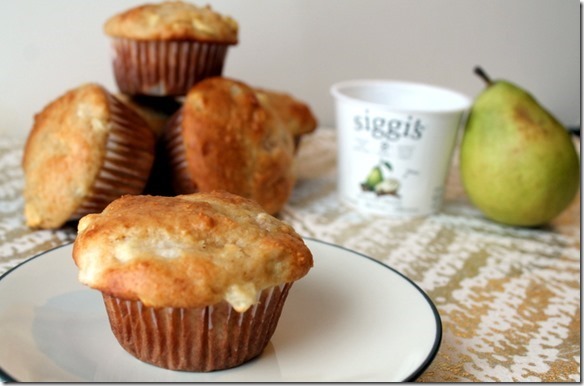 And true to Icelandic tradition, siggi’s products do not contain any artificial preservatives, thickeners, sweeteners, flavors or colors, and are made with milk from family farms who do not use growth hormones. Typically, I tend to gravitate towards their vanilla yogurt if I’m eating it with breakfast or for a snack. 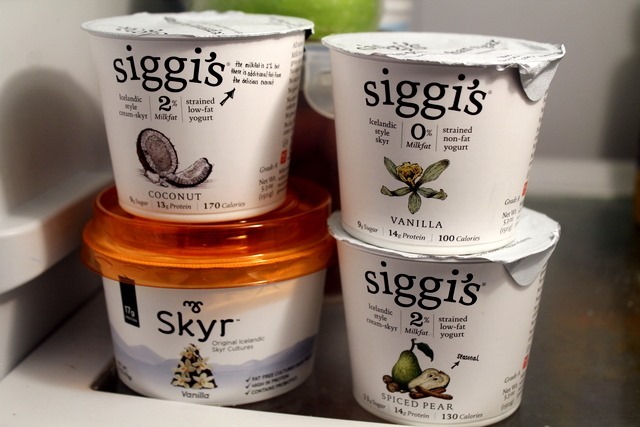 I always love vanilla, but the siggi’s variety is just top notch. 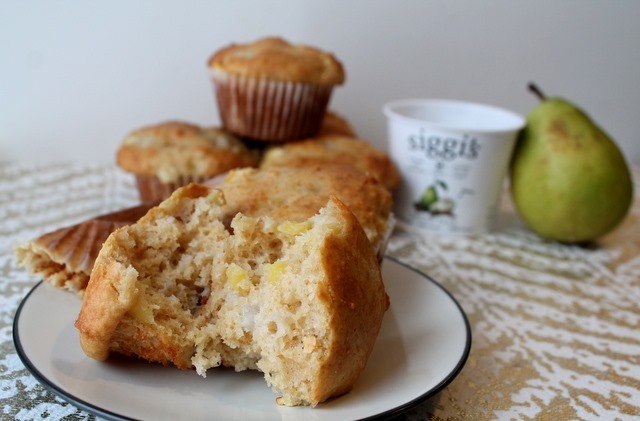 Perfect with a little bit (or a bunch) or granola. 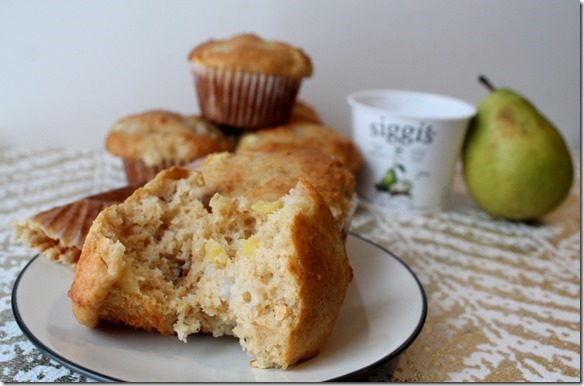 But when siggi’s recently reached out and asked me to create a recipe with one of their flavored yogurts, I decided to branch out and test some of their other varieties. And the winner was, overwhelmingly, the spiced pear. WOW. Let me tell ya…trying to photograph food with a toddler nearby is nearly impossible. But anyways…about these muffins. Definitely give them a try. 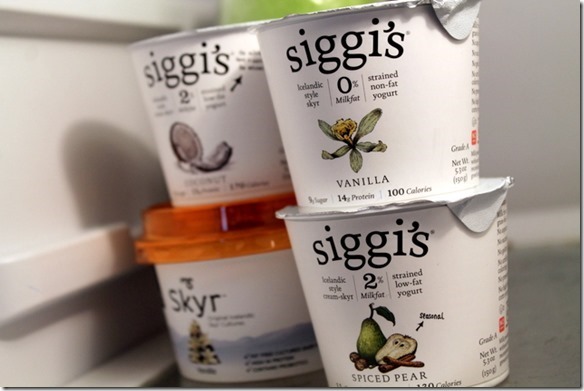 And in all honesty, if you have not yet had the chance to try siggi’s yogurt, please promise me you’ll grab some the next time you’re out shopping (I can find it near me at Whole Foods and The Fresh Market)! 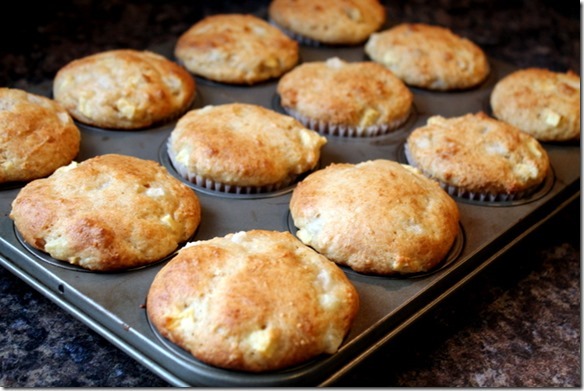 Preheat oven to 350 degrees F. Grease 12 muffin cups or line with paper muffin liners. Stir together flour, sugar, baking soda and baking powder. Toss diced pears and apples in flour mixture and set aside. In a separate bowl, combine yogurt, egg, vanilla extract, almond extract (if using), butter, and canola oil. Stir mixtures together just until combined; batter will be very thick. 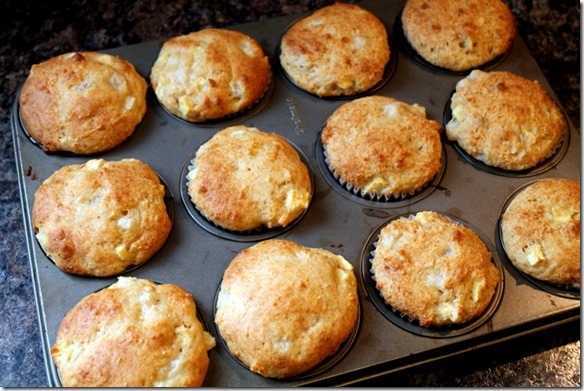 Scoop into prepared muffin cups. Bake in preheated oven for 20-23 minutes or until slightly golden and toothpick inserted in center comes out clean. Enjoy! If you want some more fun recipe ideas to use your siggi’s yogurt with, be sure to check out the Recipe Page on their site. It’s FULL of delicious sounding recipes, with everything from turkey burgers to raspberry chocolate mug cakes (OMG). Oh, I love pears in baked goods! Especially this time of year. It reminds me of the boxes of pears from Harry & David. yum!! those do look delicious - i usually make muffins from a package haha - these look manageable though! Funny, on my way to work today I was day dreaming about much I wanted some muffins! I tried Siggi's vanilla based on your recommendation and loved it! I haven't seen the pear flavor around but hopefully soon! mmmm these look delicious. yogurt is such a fab addition to baked goods! What is this "free time" you speak of? It... sounds familiar? The picture with his little hand grabbin the pear is priceless! I love that picture of Lucas grabbing the pear. So cute! 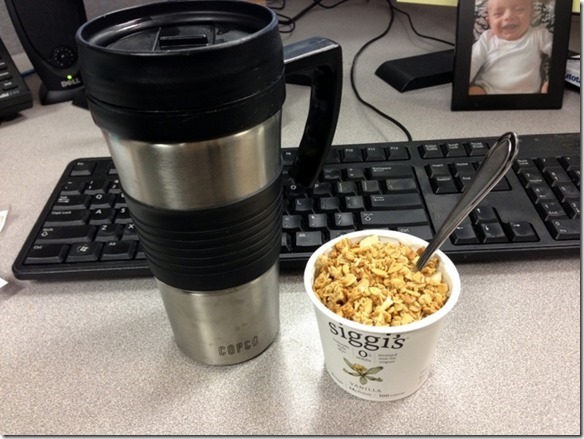 I've never heard of Siggis yogurt before. I'll have to find some and try it. 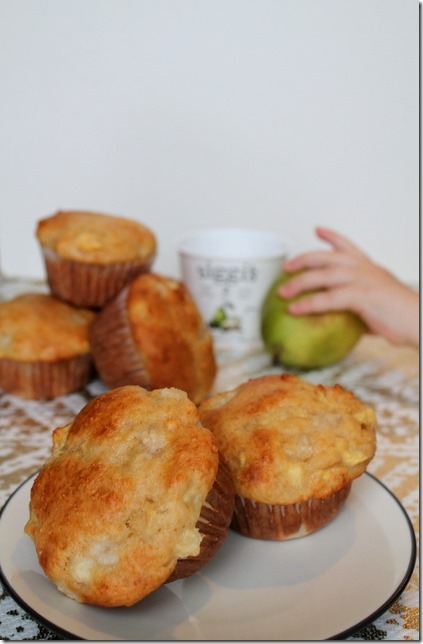 This muffin recipe looks delicious!